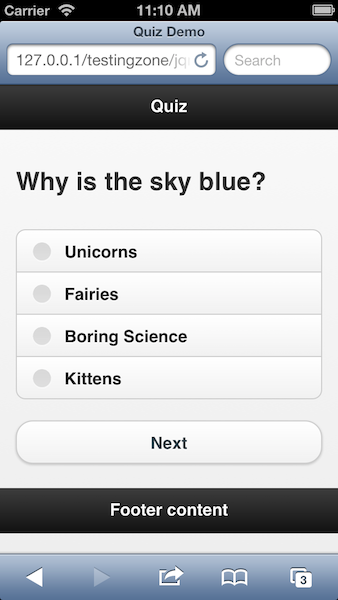 A few weeks ago a reader asked if I had ever designed a quiz for jQuery Mobile. While I had not, I spent some time thinking about how a quiz could be designed as well as how a generic library could help automate it. I've built a demo I'd like to share with folks. It is definitely "First Draft" (but hey, it lints!) so feel free to tear it apart and suggest improvements. The scheme consists of an optional introduction and an array of questions. Each question has a question value (the actual text), an array of answers, and a correct index. This is 0-based but I'm thinking it may make sense to be 1-based. My design only allows for multiple choice questions with one answer, but you could also do true/false of course. I whipped up a quick jQuery Mobile application with two pages. The first simply links over to the quiz page. Ok, now let's look at the library. There's a lot here and I'll try to explain it bit by bit. The end of the code is the public API which - for now - has one method, execute. Note how we detect if the quiz is already loaded. This way we can cache the JSON and not load it after we've fetched it once in the request. displayQuiz is the main handler for rendering the quiz. It begins (ignore the copy statement) by calling getQuiz. getQuiz handles interfacing with the quiz data as well as the user data. I'm using sessionStorage to remember where you are in the quiz. This is useful if you leave the quiz before finishing it. getQuiz also does some intelligent handling of state. So for example, if there isn't an introduction it ensures you go right into the first question. It also recognizes when you're done and checks your work. Back in displayQuiz we use the result of getQuiz to render one of three states - the introduction, the quiz itself, or the completion. By the way, the success callback is used to allow your calling code to record the results to your server via AJAX, or do anything really. All in all this was fun to write, but as I said, feels very much like a first draft. Want to try it yourself? Hit the demo link below.